The fabric is protected against spillage and unwelcomed stains. 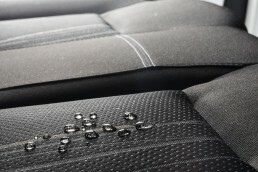 The protection encapsulates the fibres which makes it difficult for spilled liquids to penetrate the textile. If you accidently spill something you could easily remove it with a dry cloth.